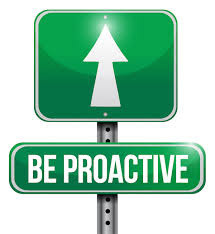 Joseph Amarah's Blog: Developing a Proactive Behaviour. The has to do with being organized, knowing the things to do at specific periods, planning your time properly. Proactive people are good time managers and there are able to live a balanced life. Having positive attitude to whatever you are doing and situation around you is very important too as this is a major factor that will lead to you being able proactive. Never be around people that are negative minded people, these set of people most times never succeed let alone try seeing positives in situations and challenges. Brainstorming helps you in not only generating different positive ideas that can help you in turning challenges to opportunities to succeed but also in planning for any unforeseen circumstance or challenge. Properly examine and choose the goals you want to achieve, within a given duration and work towards achieving them. Always be ready for any unforeseen circumstance at any time. Make it your habit to always look into situations and plan ahead. 7) Learn to be different in the way you do things. To all you need to do in time, learn to take the right action at the time such is needed. When you need to plan for unforeseen circumstances or problems or challenges, there is need for you to be flexible as each type of solution or planning is needed for its corresponding circumstance or problem. In other to be able to properly brainstorm and work towards achieving your goals, there is need for you to determine to always be consistent in achieving them. Proactive people are problem solvers, they constantly spend time looking into challenges or problem with a view to finding ways of solving them and preventing future ones. Nice and wonderful write up, we could always make our world, the world a better place and be the change we desire to see in making it better. One don't have to wait till others get it done, and not until one is at the top first before one can get things done. However, following the steps with a right and true mind as stated above, it would surely make life a more beautiful place for you and I. Nevertheless, at times we may feel discouraged or weak about not getting result or uncertainty, but one thing is for sure, we shouldn't fear to fail but we can actually fail to make a turn around success. Cheers! Thank you so much for the comment and addition, i really appreciate it. Keep on the good work, and thanks for your words of enouragement to all and as well for making people not to forget the best in them. Being proactive is almost always better than being reactive... As always nice one Joe. Keep it up! @adronhomesemmanuel. thank you so much. @ Sixtus. thanks so much for reading.